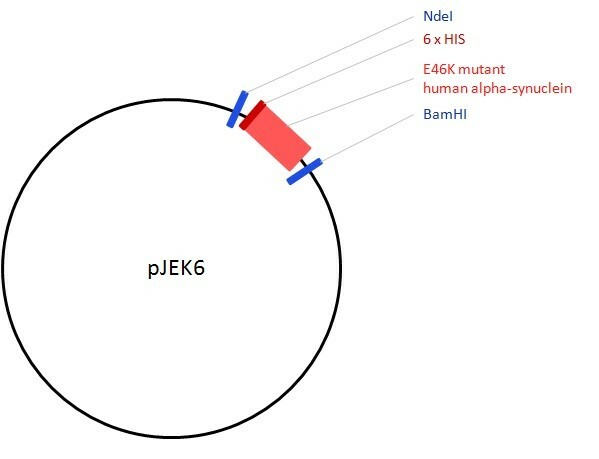 Among the familial mutations of α-synuclein in Parkinson′s disease, E46K has the greatest potential to aggregate. Notes pJEK6 ("E46K") is a derivative of pET15b with the open reading frame encoding the E46K mutant human alpha synuclein (α-synuclein) cloned in via the NdeI and BamHI restriction sites. It was constructed via site specific mutagenesis of pJEK1, replacing the G at position 136 in the ORF nucleotide sequence with A, thus altering the 46th codon from GAG encoding Glutamic Acid (E) to AAG encoding Lys (K). In this construct E46K α-synuclein is expressed as a fusion protein with an N-terminal six His tag.